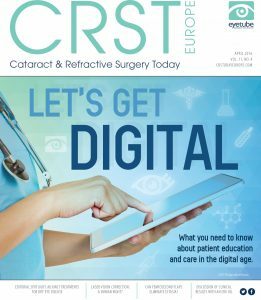 An overview of selected products and their uses for the management of ocular surface disorders. Figure 6. The MiBo Thermoflo device. 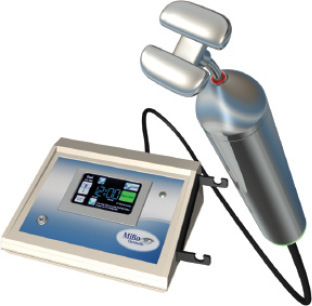 The MiBo Thermoflo (MiBo Medical Group; Figure 6) is a therapeutic device for the treatment of DED. It employs a proprietary thermoelectric heat pump to help maximize liquefaction of meibum, thus improving preservation and function of the tear film’s evaporative component. For best results, it is recommended that physicians perform three treatments, 2 weeks apart, evaluating patients after that cycle to determine whether they require a fourth treatment. Most patients are able to go 12 weeks before requiring additional treatments, but some request frequent treatments for comfort due to daily eyestrain, according to the company. 1. MiBo Thermoflo. http://mibomedicalgroup.com/. MiBo Medical Group. Accessed March 14, 2016. MiBo ThermoFlo safely manages perioperative dry eye from MGD (Figure 7). Blepharitis and tear deficiency frequently complicate surgical results in LASIK, cataract surgery, and corneal transplantation. An otherwise perfect surgery, compromised by mild dry eye–related visual fluctuation, can cost the busy practitioner significant chair time and may degrade patient confidence. MiBo treatment is quick, convenient, comfortable, and focused on the underlying pathology. More important, MiBo can also address moderate to severe tear film deficiency threatening both acuity and ocular health. In my opinion, this device belongs in the repertoire of the busy anterior segment surgeon. MiBo is a low-cost adjunct to premium and standard cataract surgery. Because lipid-deficient DED dominates this demographic, pre- and postoperative MiBo treatments can prevent problems and enhance patient satisfaction. When warm compresses and patient-centric lid hygiene regimens fail, in-office therapy with MiBo can improve patient care and clinical results. Theoretically, patient safety is enhanced by decreasing excessive lipids and their associated bacterial load. I routinely administer MiBo to cataract patients with excessive lid disease preoperatively and often at least once in the postoperative period. The device is extremely helpful when patients claim that they are not seeing as well as they had hoped, and the tear film is the cause. Figure 7. Thermal depiction of MiBo Thermoflo on an infrared camera with pseudo-color encoding: before treatment (A). 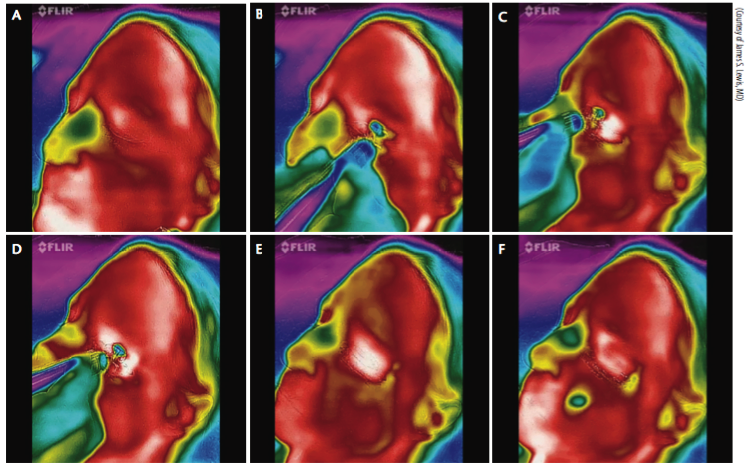 The red skin temperature is warmer than the green nasal passages (B). MiBo heats the upper and lower lid skin to a hot white color (C). The entire meibomian gland apparatus is elevated to 108oF (D). After removal of MiBo’s emissive heat, the lid remains warm (E). More than 1 minute later, a therapeutic effect is seen (F). LASIK patients benefit from MiBo even when their MGD is minimal or subclinical. The tear film disruption inherent in the procedure responds well to this treatment. I have performed MiBo on LASIK patients within 48 hours of the procedure. In my experience, MiBo treatments hasten re-epithelialization after epi-LASIK and PRK and also help those undergoing flap lifts. Visual fluctuation resulting from changes in corneal architecture and interruption of the nerves is well addressed by this treatment. I find MiBo useful before and after all types of penetrating keratoplasty. I have used MiBo in the first postoperative week following Descemet stripping endothelial keratoplasty and Descemet membrane endothelial keratoplasty. For neglected patients with prolonged epithelial edema prior to surgery, it can take weeks to recover an acceptable surface. MiBo has been helpful in this clinical scenario as well as in full-thickness keratoplasty and deep anterior lamellar keratoplasty. Although most clinicians will use MiBo as an inexpensive, convenient, and effective therapy for MGD and associated DED, I find it indispensable in the management of a diverse collection of anterior segment surgical procedures. MiBo decreases infection risk preoperatively and hastens epithelial regrowth, thereby reducing the risk of scarring in the early postoperative period. Equally helpful is MiBo’s ability to enhance the tear film following LASIK and premium IOL surgery for patient comfort. Optimizing ocular surface health helps to control fluctuating vision and bolster patient satisfaction, thereby promoting practice growth. I temporarily lost access to my MiBo this past year when I sent it back to the company for an upgrade. Only then did I realize how dependent I had become on this seemingly simple but efficient device. MiBo is an essential tool for the anterior segment surgeon.